Joe Biden during a Martin Luther King Jr. Day breakfast hosted by the National Action Network in Washington. Joe Biden swept into Benton Harbor, Michigan, three weeks before the November elections, in the midst of his quest to reclaim the Midwest for Democrats. He took the stage at Lake Michigan College as Representative Fred Upton, a long-serving Republican from the area, faced the toughest race of his career. But Biden was not there to denounce Upton. Instead, he was collecting $200,000 from the Economic Club of Southwestern Michigan to address a Republican-leaning audience, according to a speaking contract obtained by The New York Times and interviews with organizers. The group, a business-minded civic organization, is supported in part by an Upton family foundation. The remarks quickly appeared in Republican advertising. The local Democratic Party pleaded with Biden to repair what it saw as a damaging error, to no avail. On Nov. 6, Upton defeated his Democratic challenger by 4 1/2 percentage points. As Biden considers a bid for the presidency in 2020, the episode underscores his potential vulnerabilities in a fight for the Democratic nomination and raises questions about his judgment as a party leader. Biden has attempted to strike a balance since leaving office, presenting himself as a unifying statesman who could unseat President Trump while also working to amass a modest fortune of several million dollars. But Biden’s appearance in Michigan plainly set his lucrative personal activities at odds with what some Democrats saw as his duty to the party, linking him with a civic group seen as tilting to the right and undermining Democrats’ effort to defeat Upton, a powerful lawmaker who in 2017 helped craft a bill to repeal the Affordable Care Act. 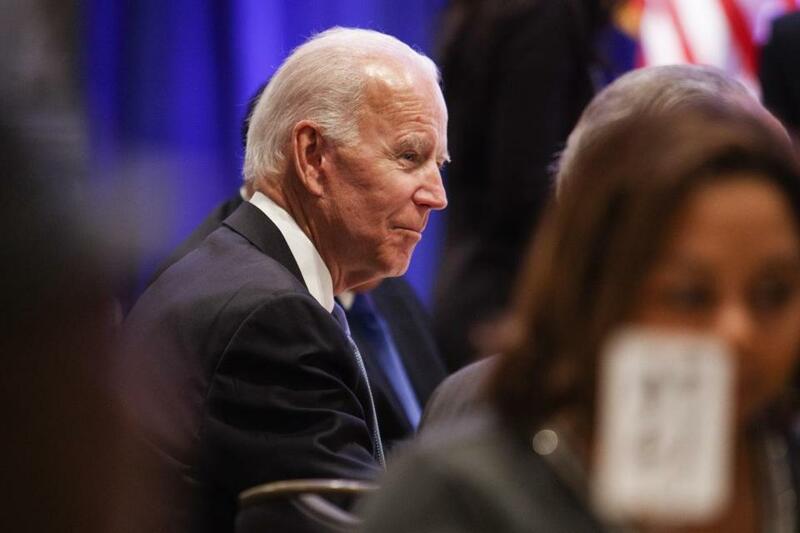 Eric Lester, a retired physician who chaired the Democratic Party in Berrien County, Michigan, during the midterms, said he viewed Biden’s supportive remarks about Upton as a betrayal. Lester, who attended the speech, said he had confronted an aide to Biden in the hallway, telling him the former vice president had badly damaged the Democratic cause. Joe Trippi, a Democratic strategist and veteran of several presidential campaigns, said it was an open question whether voters in the party would punish candidates they see as overly friendly or cooperative with Republicans. He suggested that could be one of the defining pressures for Biden if he announces his candidacy. Several people involved in planning the event said Upton, 65, had no role in arranging Biden’s appearance, and Upton said he was not involved. There is no evidence Biden was motivated to praise the lawmaker by anything other than sincere admiration, stemming from Upton’s role in crafting the 21st Century Cures Act after the death of Biden’s elder son, Beau, from cancer in 2015. Bill Russo, a spokesman for Biden, said the research-funding legislation was the foundation of Biden’s relationship with Upton. The speaking contract for Biden’s October appearance in Michigan suggests that the popular Democrat would have known he was addressing a Republican-leaning crowd. The speaking series was underwritten in part by organizations connected to Upton’s family: Among the biggest sponsors listed on the Economic Club’s website are the Whirlpool Corp., which was co-founded by Upton’s grandfather, and the Frederick S. Upton Foundation, a family charity named for the same man. The contract for Biden’s visit shows he was paid $200,000 for his appearance, including a $150,000 speaking fee and a $50,000 travel allowance. It also specifies that the audience would be “primarily older, conservative Republicans and local community members.” The document was disclosed in response to a Freedom of Information request made by America Rising, a Republican group that conducts research on Democratic candidates. Representatives of Lake Michigan College, which recently took over management of the Economic Club speaker series, and the Fredrick S. Upton Foundation confirmed that the Upton organization was a major sponsor of the series. Both organizations said Upton had no role in proposing or choosing the speakers. Lisa Cripps-Downey, president of the Berrien Community Foundation, a nonprofit that administers the Frederick S. Upton Foundation, confirmed that the organization had given substantial funding to the Economic Club, with an annual grant of $80,000 over the last three years — a total close to a quarter-million dollars. “When we see the speakers, we’re just as surprised as everybody else,” Cripps-Downey said. Russo said Biden’s team had been aware that the Frederick S. Upton Foundation helped fund the Economic Club. He said Biden aides had vetted the funding sources for the speaking series and concluded they met his standards.